When I entered the national downhill series at the start of the year I was unsure about racing Fort William. It’s a world cup track that I watched my heroes race on tele each year and it is renowned for being difficult and very long. I was pretty sure I was not fit enough to race there and was intimidated by the thought of the track without even seeing it! I’m terrified of board walk and I knew there was a lot of board walk at the top in the windiest part of the track. A friend told me he would never race Fort William on his own bike as he couldn’t put his bike through the beating that track gives out. I had got a new bike, Sybil, that I was feeling a bit precious about. Then the banter started with friends and before I knew it we were all booked to go. I met up with Matt from The Physio Clinic, my strength and conditioning coach, told him what I had planned and asked if he could help. Matt had complete faith that I could race it and a few weeks later I had a training plan for the entire season to get me in shape! My goals for the weekend were to make it down the track and across the finish line, rebuild some of my confidence after my crash and injury last year and to have fun. My perfect planning meant that I needed to back home Sunday night for a work conference Monday, I decided that there was no way I could drive home straight after my race alone. The logistics of flying, finding a lift for my bike, sorting accommodation etc were not ideal and made the whole race feel like a really big deal but I arrived in Scotland on a rainy Thursday without a hitch. The cloud lifted in the evening revealing the mountains in all their glory. Friday didn’t go quite to plan as I arrived at the venue to see a car park full of grumpy looking racers. Lots of riders were there early hoping to get in some sneaky practise before official practise started on Saturday but the wind had stopped play as the gondola couldn’t run in the gale force winds. The track is 3 times longer than any other tracks we race making it difficult to get enough practise runs in one day to learn lines. With no practise Friday and a track I had never seen before things weren’t looking too hopeful! We walked the track which went on forever and scoped out lines. I wasn’t sure I could ride all of the features on the track and the new rock garden they were still building in the woods looked hideous. The Hazard Hoofer (famous gap jump over a river!) looked terrifying, I had never really hucked anything that flat or far before and I decided that a river gap wasn’t the place to learn, it’s an actual river! However riding through the river didn’t look that appealing either but based on risk it was the way I was going to have to go. I left the venue feeling more nervous than when I arrived. I barely slept Friday night, my head wouldn’t shut up about all the scary things waiting for me on track the next morning. The day finally dawned and it was a scorcher, wide blue skies and bright sunshine, not what I expected at all. The usual banter was absent on the journey to the venue and we all looked like we were off to an unpleasant dentists appointment rather than riding bikes. We got the gondola up the mountain and gathered in the famous Fort William start hut. A deep breath, some “you can do this” supportive comments to each other and I dropped in to the track for the very first time! My bike skipped over the rocks and the big boulder filled drops that I had scrambled up yesterday were eaten up by Sybil’s suspension and I discovered I could ride them after all. We got to the deer gate and joined the crowd for a break. Apparently we were half way down… only half way!!! Already my arms and legs were burning and I felt like I’d shaken all my teeth out, suspension can only do so much! We got to the completed rock garden and stopped for a look; the mud was tracking all over the boulders and the lines looked awkward. A run through it proved that it was as awkward as it looked with a fine line between having enough speed to get over the rocks and not too much to make the corners. I stalled in the second corner and had a beautiful SPD fail in front of a huge crowd. I grabbed a tree avoiding injury but the rocks proved their hardness on my forks and my new trousers. I made it safely through the river, it was way slower than hitting the Hoofer but surprisingly good fun. I came in to the motorway section at the end and couldn’t believe how far away the finish line still was! The first step down proved to be bigger than it looked on the track walk and I narrowly avoided a big crash but the heavy landing didn’t go unnoticed by my shoulder and ankles! I crossed the line with a big relieved sigh, I had made it… and then the terror kicked in when I realised I had to go and do it again! We donned mirrored lenses, yes that’s right, mirrored lenses in Scotland and headed up for another run! The view from the gondola was spectacular until you looked down at the track where there were bodies and bikes strewn everywhere surrounded by busy medics rushing around. The track was claiming a huge list of bodies and bikes. Our second run came to an abrupt stop 2/3 of the way down the track when my team mate Emily had a nasty crash. After some time with the medic we took the scenic fire road down to the race arena and chilled out with lunch. Proving she is harder than nails Emily got back on track as we started our 3rd run down. It was all going well and I was starting to enjoy the track and remember my lines, I even started smiling. Then I bounced off line in the rock garden, tucked my front wheel under, slammed my chest on to my bar end and bounced head first through the boulders. I managed to escape unscathed other than some bruises and a bent mech hanger, so bloomin lucky! Tired and with no enthusiasm for another run we packed up and made our way back to the caravan for a rock and roll night of stretching and rhubarb and custard cider. After a tough day on track I slept beautifully until 5am when I woke up in terror and that was that. Physically I didn’t feel too bad and was feeling grateful for all the hard work I had done in the gym. I might have previously thought Matt was a sadist but I couldn’t help but feel grateful for my quick recovery. I lined up in the start hut for a practise run feeling more terrified than the day before. The rain fell softly, the sky was grey and the rock garden was still part of the race track! I made it down the track with no issues, swearing and whooping in the rock garden when I made it through cleanly much to the amusement of the spectators. The sun came out, qualifying runs started and my nerves were so bad I was literally shaking. The ladies lined up for the qualifying run and the usual guffawing and banter was absent as everyone composed themselves for their first full run down the track. I wasn’t sure how I would get to the bottom without having a break but I’d been told the way to do it was sit down where it was smooth enough to give your arms and legs a break! The dreaded start beeps ratcheted my panic a little bit higher and I suddenly couldn’t wait to get started so it was over faster. I settled in to my run and started to have fun. I knew about racing and this was just another race. I quickly caught the rider in front which doesn’t happen very often but I managed to overtake and reclip just before the rock garden. I rode the rock garden, it was ugly but I got through and was rewarded with another few seconds of sitting down to get some life back in my arms and legs. I arrived in to the finish arena having made it from the top to the bottom in one go, wahoo. I was utterly elated and grinning, even the thought of going again was exciting right up until the point that I had to put my kit back on when the fear returned. Feeling worried I got in the gondola for the final time emerging at the top to bright sunshine and a huge queue. The track was shut and we settled in to the café for a long wait. The banter started, an impromptu lesson on The Floss took place and Fort William turned in to a normal race venue. We waited for a long time and just like round 1 I struggled to psych myself back up once it was finally time to ride. The wind had been steadily building and was blasting across the open top section of track by the time we lined up for race runs. My nerves settled and I set off trying to tuck across the board walk so I didn’t get blown off. I was riding calmly and my usual ragged race form was nowhere to be seen. I caught sight of a rider ahead of me as we approached the deer gate and finally caught up in the rock garden. Great, just perfect, overtaking in the rock garden sounded just terrifying. I had no time to decide, called rider, she moved immediately and I was past with my best line through the rock garden all weekend. I caught another rider as I came in to the motorway section, my legs were made of lead as I pedalled hard for the line. I had made it! I raced Fort William, I made it across the line and I even had fun! I had achieved all my goals for the weekend and the atmosphere in the finishing arena was incredible. I managed to ride some board walk and for those that have seen me crying stuck on a boardwalk platform before this was a big deal! In previous years the Monday after a race weekend was hell. I used to feel like I’d been hit by a bus and could barely move. After round 1 last month I felt pretty good on the Monday but I expected Fort William to have destroyed me. As it turned out I actually felt pretty good this week other than a few small injuries. This time last year I was having my shoulder screwed back together followed by a very long recovery. 6 months ago I didn’t have the strength to do a push up. 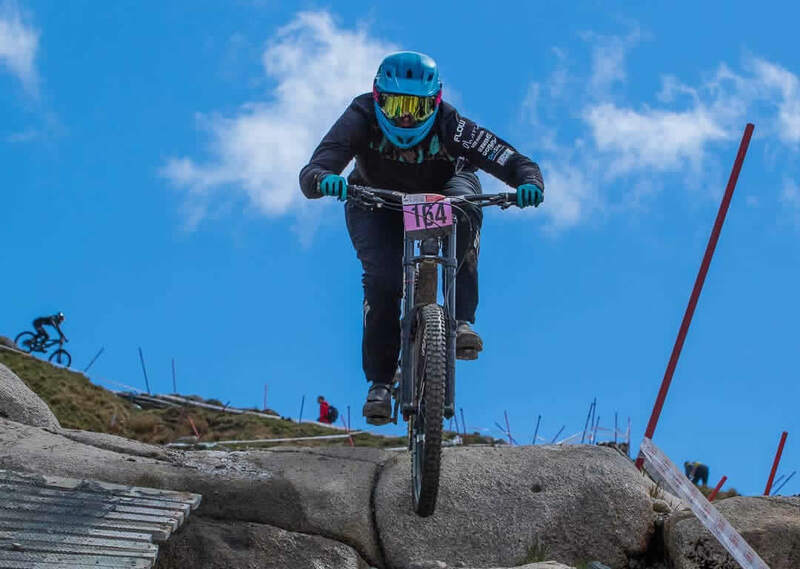 This weekend I rode the Fort William track, felt strong all weekend, recovered after each run down the track and didn’t even feel too bad on Monday. A lot of people have asked me how relevant my strength and conditioning gym programme is to riding and I think this is the best demonstration of the difference it has made so far. I can’t thank the Physio Clinic enough for all their help and support getting me not only back on a bike but better than ever!